February 1, 2015. Since my recent face-smashing fall had made me a bit gun shy about the ice, we decided that walking (using crampons) as a form of exercise might be a bit safer than skiing. So on Sunday, we rode the Trikk up to Ekeberg Parken, which hovers on a distant hill outside the city proper. The more winding route we elected to ride took us through some grittier neighborhoods new to us, but marked by the passage of time with layers of graffiti and city grime. Abandoned warehouses and storefronts spoke of a more commercial, industrial history to the area. Some blocks showed signs of adaptive reuse and gentrification, but it’s clear that large-scale urban renewal was still waiting in the wings for a chance to really make a stage entrance here. Gone were the rows-upon-rows of “Grand Dame” townhouse architecture so prevalent elsewhere, and only a few careworn “Victorian Ladies” remained, clustered together for comfort amongst the hard-edged landscape. Newspapers and sheets over windows gave an indication that prosperity was still mostly passing by the people here, and the dark faces on the street showed why. Clearly, the neighborhood was home to recently immigrated North Africans and others of Arabic or Indian descent who were brand new to Norway’s social systems and still working to carve out their place in Oslo’s affluency. As it turns out, this economic trend is an old story for the area, which was long home to the working class. In fact, the city of Oslo created Ekeberg Parken in 1889 as a refuge for east-side factory workers, who didn’t have access to places like Frogner Parken. The goal was to provide fresh air and nature to those who spent their lives toiling in an unhealthy atmosphere. So like the workers of yesteryear, Matthew and I planned to spend our “free Sunday” recovering from our grueling workweek by taking in Ekeberg’s offerings. “Walking Woman,” by artist Sean Henry. Absolutely everyone gets their photo taken holding the hand of this giantess. 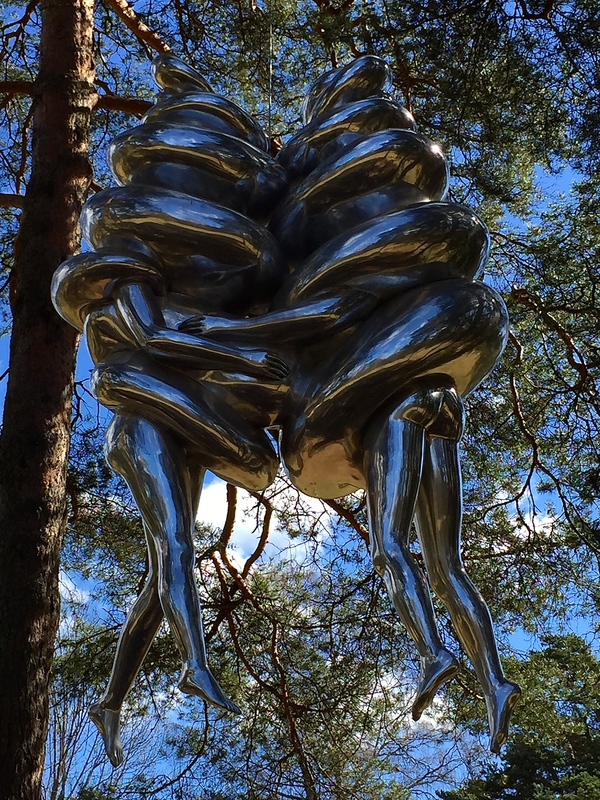 Like Frogner, Ekeberg has a controversial Sculpture Park currently made up of 31 sculptures (more to come soon) from the collection of Christian Ringnes, heir to the Ringnes Brewery fortune. I say controversial because locals greatly protested the takeover of their public park by a private entity, who peppered the peaceful woodlands with sculptures some view as tasteless and chauvinistic. But we were prepared to keep an open mind as we threaded our way through the frozen landscape and took in the snow-covered views of Oslo’s fjord below. Our first stop was Skyspace, an installation by American artist James Turrell. If you’re not familiar with his work, he’s most famous for creating spaces that play with light, generating optical illusions that distort depth perception and imply infinity. He has built several Skyspace installations around the world, including one in Chicago that is arguably among his least successful works, mostly due to the cacophony of its surroundings at University of Illinois, Chicago (UIC). To view his recent installation at Ekeberg, we simply showed up for for one of the tours offered between 12:00 – 4:00 p.m. on Sundays. From the outside, Skyspace appears fairly unassuming (see the big photo above). It’s built into an old water reservoir, so from above, you’ll see only a concrete cone poking out of a tiny frozen pond bordered by a short boardwalk. The real show doesn’t start until you’re inside, and access is further downhill, through a narrow stone-and-concrete tunnel that burrows into the grassy hillock beneath the pond. A guide escorted our group into the tunnel — only eight people can enter at a time — where we were requested to remove our shoes. This proved to be a tricky task to perform in almost complete darkness, and a loud squawk let me know that I’d accidentally grabbed a total stranger in an inappropriate place in order to avoid toppling over. Lack of balance proved to be a theme throughout the experience, so if you’re planning on visiting, I’d definitely heed the signs that warn those with epilepsy, balance issues, or motion sickness to rethink their plan. After our eyes adjusted a bit, our guide led us down a hallway to the first experience, a double-infinity space called “Ganzfeld” that’s punctuated by two curved portals or arches on either side of the hallway. 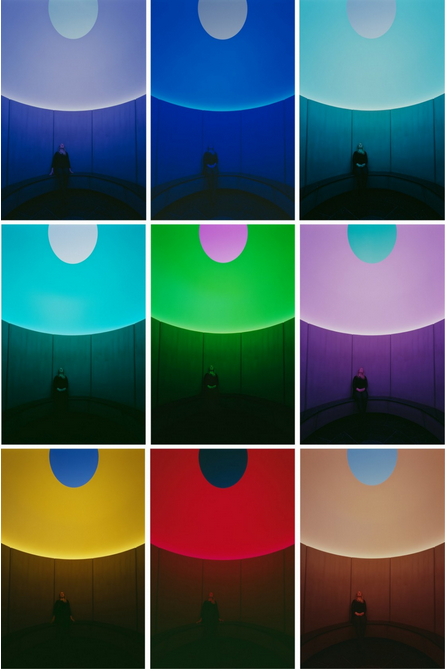 Recessed lighting gradually changed color over time, from cheerful orange, to meditative blue, running through the full spectrum of the rainbow over about a half hour. Interestingly, certain shades made it almost impossible to see precisely where the portals ended and the curved walls beyond began. I had to feel with my toes to avoid stepping off the end of the portal platform into the seeming abyss, although the guide assured us that the drop-off was only about a foot or so deep. He explained that the optical illusion of infinity is created by keeping the softly curving exterior walls on either end of the portals completely pristine. Staff regularly vacuum and re-paint the space, because cracks in the plaster, dirt, and debris destroy the perception of endless light. True to form, a self-appointed art critic in our group began visually scouring the space and pointing out every tiny flaw, from dust motes to gnat carcasses, which he felt disrupted his experience. There’s always one in every crowd…. After about ten minutes, our guide invited us to enter the next space, just in the nick of time — I’d discovered that the play of light and curvature really wreaked havoc on my sense of balance, and motion sickness threatened. Can’t imagine how the art critic would have responded if I’d contributed my own “Jackson Pollack” to the room’s flaws. Sweating and slightly shaking, I stumbled into the next room, which thankfully had hard-edged parameters that my brain could manage better. The Skyscape room with a view out the oculus. Again, courtesy of the Ekeberg Parken website. The circular wall of this domed Skyspace was lined with a stone bench meant for sitting and contemplating the oculus overhead as the light shifts around the room. Open to the air above, the aperture acts as peephole into Oslo’s constantly shifting weather. Today, the solid gray heavens flaunted no clouds to destroy the illusion of infinity created by the smooth walls that swept up to the sky. As we all sat quietly, tiny flakes of snow sifted through the opening and collected on the center of the stone floor beneath. A soft hush enveloped the room, reminding us that the Quaker artist had designed it for quiet group meditation, similar to his faith’s Meeting Rooms. Of course, after just a few minutes, the “art critic” decided to disturb our peace and test the acoustics with an ear-piercing whistle. I’m pretty sure he came within a hair’s breadth of being shanked by the heavily tattooed bruiser in our group. But fortunately, another couple managed to restore the zen-like atmosphere by breaking out into what sounded like a soft, Gregorian plainsong. Feathers soothed, we all settled down and earned an invitation to come back at the end of the day (reservations required) to witness Skyscape’s natural light show as the heavens shift from powder blue, to sunset orange, to cobalt night. Matthew says doggie doo, I say swirly ice cream cones. No offense to the artist, Louise Bourgeois. After exiting the exhibition space, Matthew and I decided to take in some of the other outdoor artwork, which focuses on female artists and themes in opposition to the masculine mindset of Vigeland’s Sculpture Parken. I have to be honest in that some of these pieces weren’t exactly to our taste — Matthew theorized on the origins of one sculpture, stating it looked like a couple who’d been publicly punished for non-conformity (a big sin here) by being strung up in a tree and made to wear goofy doggy-doo costumes. But to be fair, the pathways were so icy that we weren’t able to take in all the park had to offer. Freezing, we decided to go for warmth and food (of course) at the Karlsborg Spiseforetning. Spiseforetning means “restaurant” — the actual translation is “eat business.” Sorry to digress, I’m constantly fascinated by how literal Norwegian is. Anyway, the restaurant is a clapboard-sided Victorian beauty, with Carpenter Gothic touches on the porches, delicate chandeliers, and gorgeous cast-iron pipe stoves that heat the rooms. Guests can grab a sandwich to eat outside in the garden, or dine inside on more elaborate meals. I have to say, the crab dumpling appetizer, lobster bisque, and salmon smørbrod were truly terrific, and we’ll definitely be back. The fabulous view of Oslo’s fjord from the porch. An homage to “The Scream” by performance artist Marina Abramović. The restaurant has an interesting history: originally a private home, it was a frequent haunt of The Scream artist, Edvard Munch (pronounced “Moonk”). While visiting a friend who owned the home, he went for a walk in the nearby woods, now Ekeberg Park. As he approached a vantage point overlooking the city, he said he heard a terrifying scream, as if the entire forest were mourning modern life and the industrial wasteland below. (More likely, he heard screams from the nearby insane asylum.) It was from this vantage point that he later painted The Scream. We tried to find Munch’s overlook, but the bitter cold discouraged us. Oh well, a good reason for another visit on a warmer day.